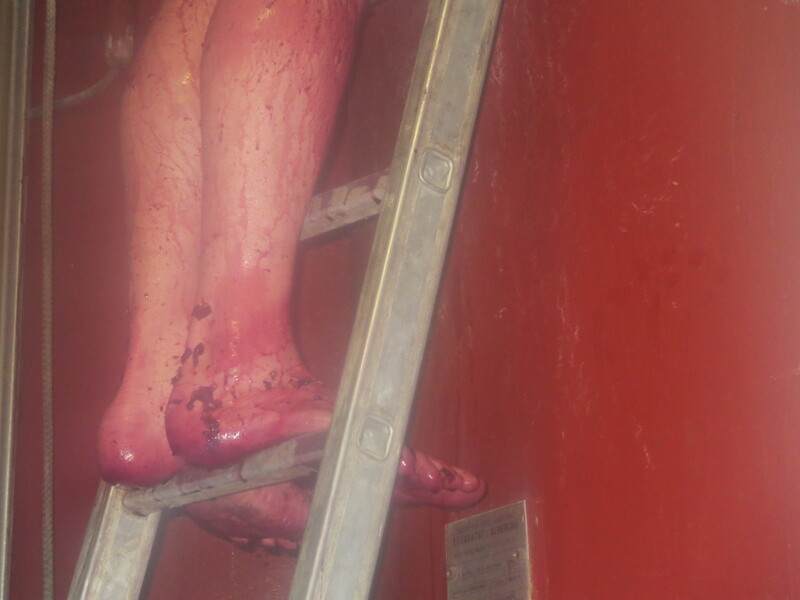 This was the busiest week of the vendanges and required long hours of picking, sorting, pressing, remontage as well as lots and lots of carrying, lifting and often in confined spaces. In short it was hard work. Why so busy? 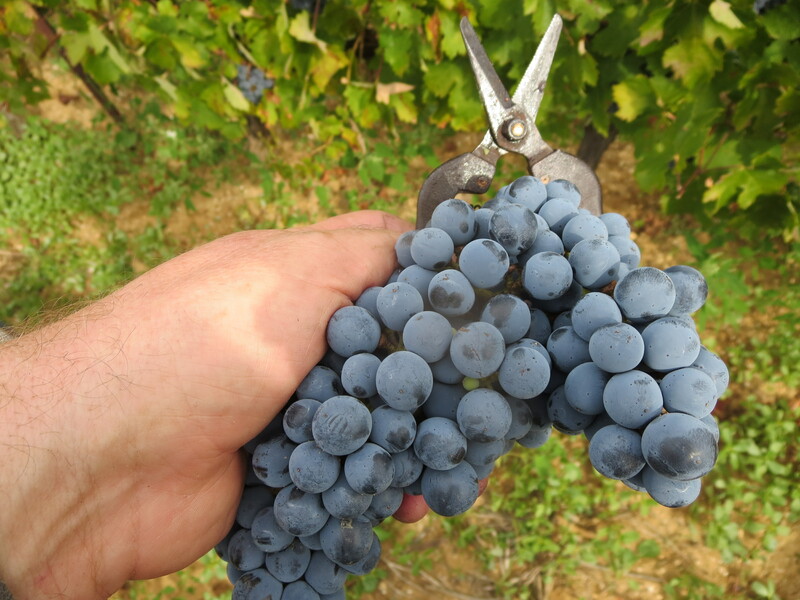 Well, Syrah which was the first of the red wine grapes to ripen makes up around a third of all the vines at Mas Coutelou and Grenache, the next to ripen, is also the next main cépage with up to 12% of the harvest. Together this meant that around half the 2015 harvest would be picked this week. 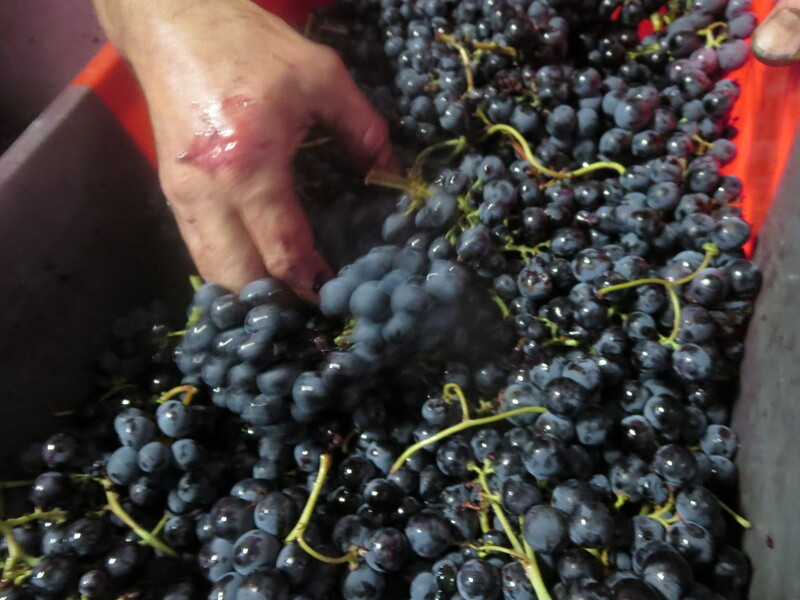 Add in other smaller picking and the parcel of Merlot and this was definitely the crunch time. Sunday September 6th was a day of rest for most but Cameron and Jeff were in the cellar working as usual, carrying out checks and analyses and remontages as necessary. Monday 7th was a long day at work. It was around 8.45pm before we stopped. 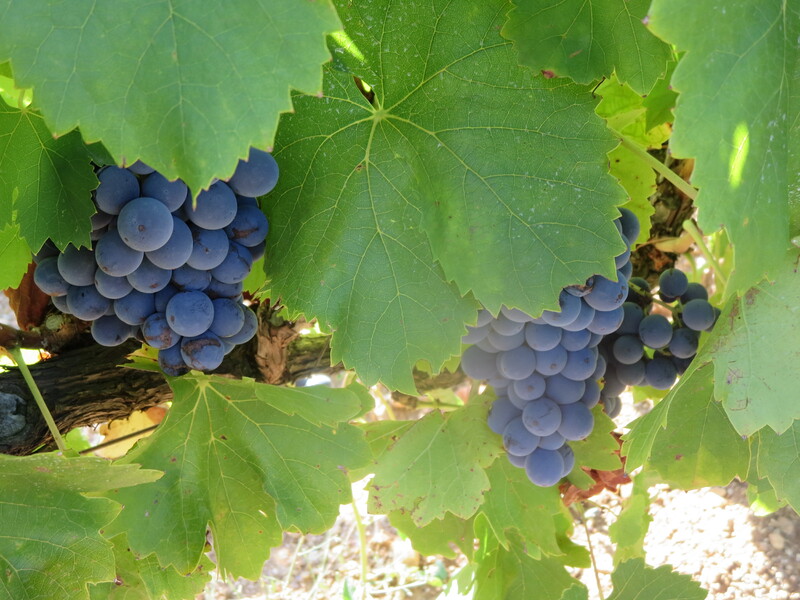 Syrah in Segrairals makes up around 2ha in total, though as with all land there are some prime areas whilst other vines, around the edges and in a few hollows where water gathers, are not of the same quality. In a typical year these would go towards cuvées such as Classe and 7, Rue De La Pompe but, as ever, plans are fluid. 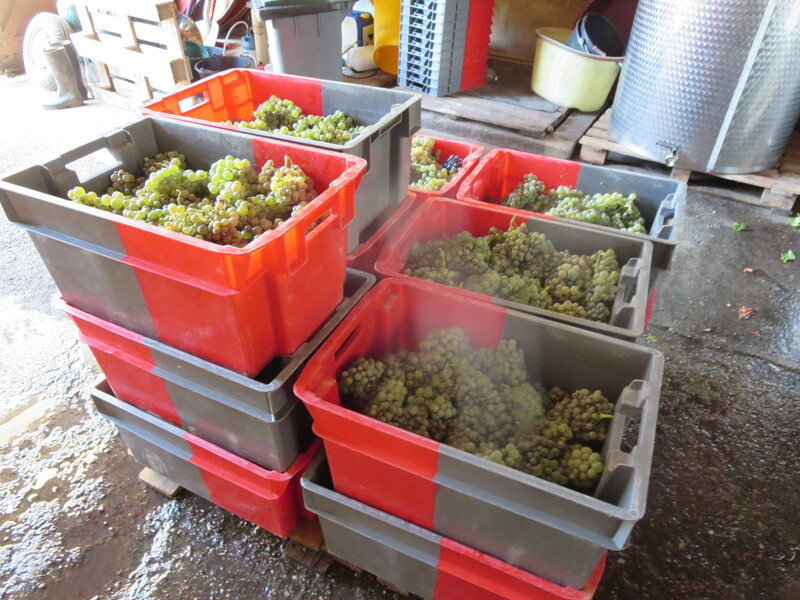 In addition a parcel of Carignan Blanc was harvested from Peilhan vineyard. 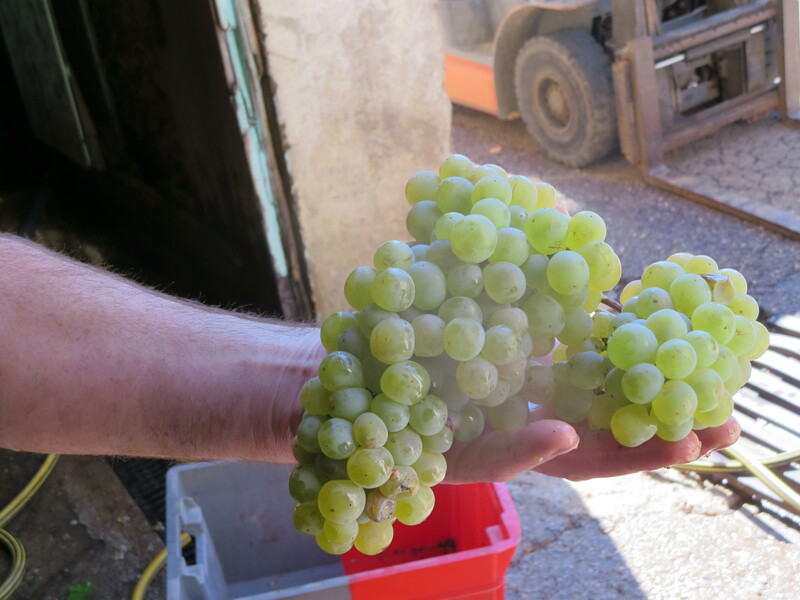 There were some wonderful grapes and they were given special treatment, carefully sorted and then pressed using the small hydraulic press. 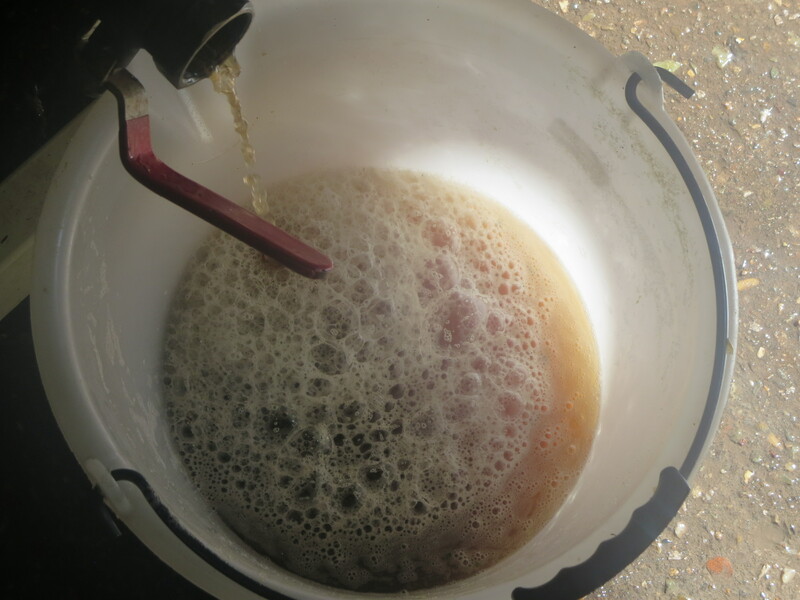 The juice ran very clear and green and then gradually took on a slightly brown colour as it developed light oxidation. This is actually good as it helps to protect the juice later in its life and prevents damaging oxidation. 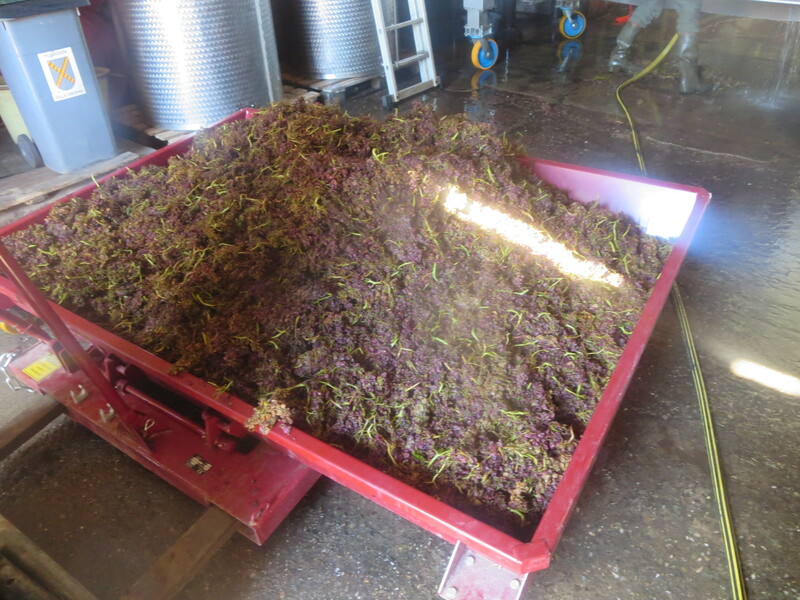 Moreover, the effects of the oxidation from the pressing are removed through fermentation. Around 600l were produced in total, around 750 bottles worth. This makes a very good wine, something I was to be reminded of on Tuesday night, as we shall see. This was a long day but much good work had been done. 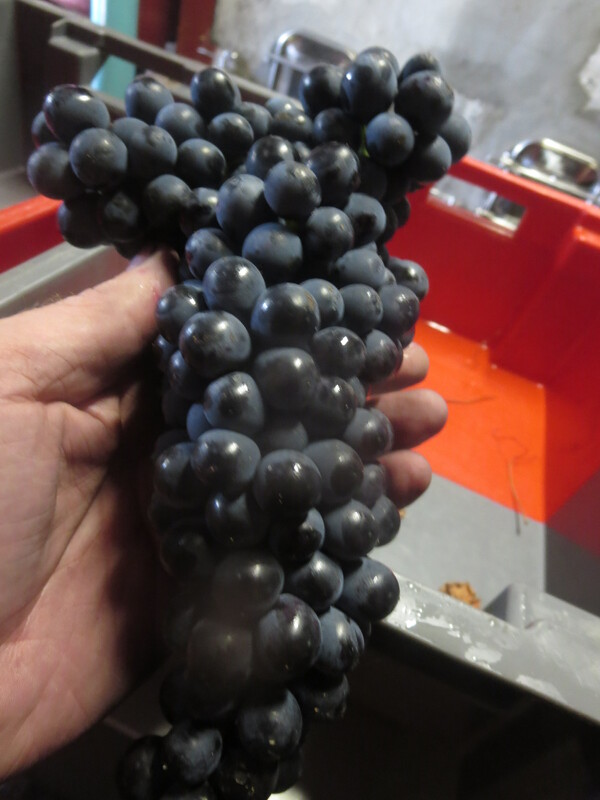 Tuesday 8th brought more Syrah to the cellar, this time from La Garrigue. These are the vines I have described before which face north on a slight slope to preserve the freshness and fruit flavours, good quality grapes which are often used for my favourite cuvée, La Vigne Haute, so I was even more keen to help to sort carefully and there were some lovely bunches of healthy fruit. Here’s hoping for a good vintage of LVH, as ever Jeff will make the call. 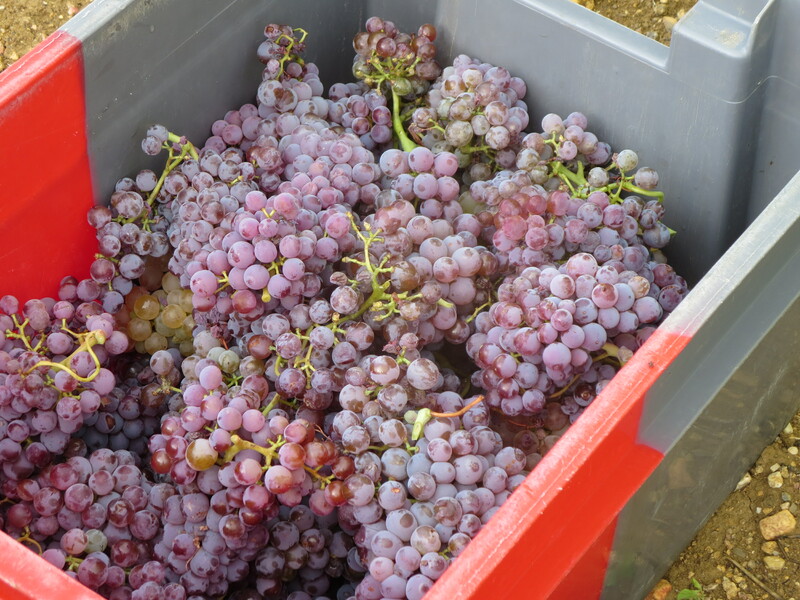 Yet again another smaller harvest was done, again from Peilhan, this time with Grenache Gris. The lovely pink, grey berries are flexible in their use and might produce, white or rosé wines or be added to red wine as you will remember from my special cuvée post. 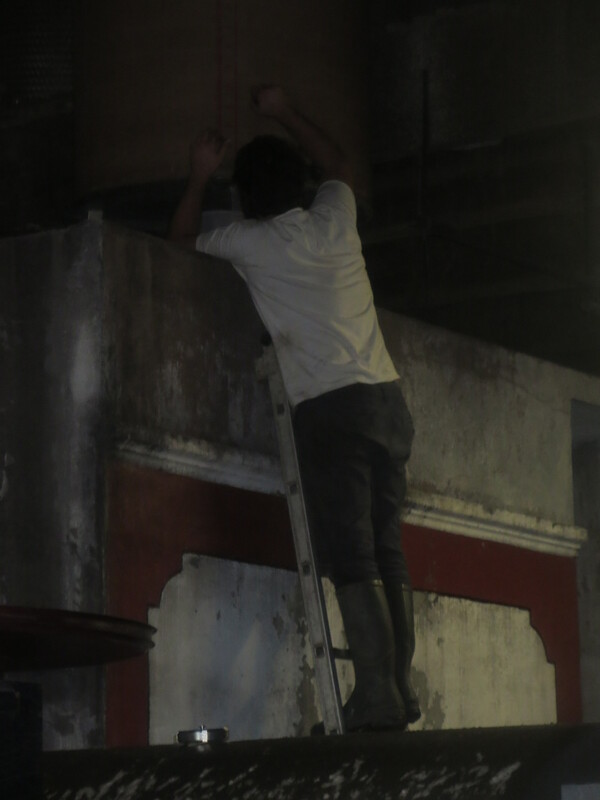 Meanwhile lots of analysis of the wines in tank and work to ensure that they are in good health. This even involved Jeff removing his trousers and jumping into the Flower Power tank to do some pigeage! Modesty means that I shall not share these photographs! A bonus was to come though. We had been joined by two new additions to the team. Thomas is from Toulouse originally but has been working as a sommelier in the Languedoc and spent most of the week with us and will return next week. 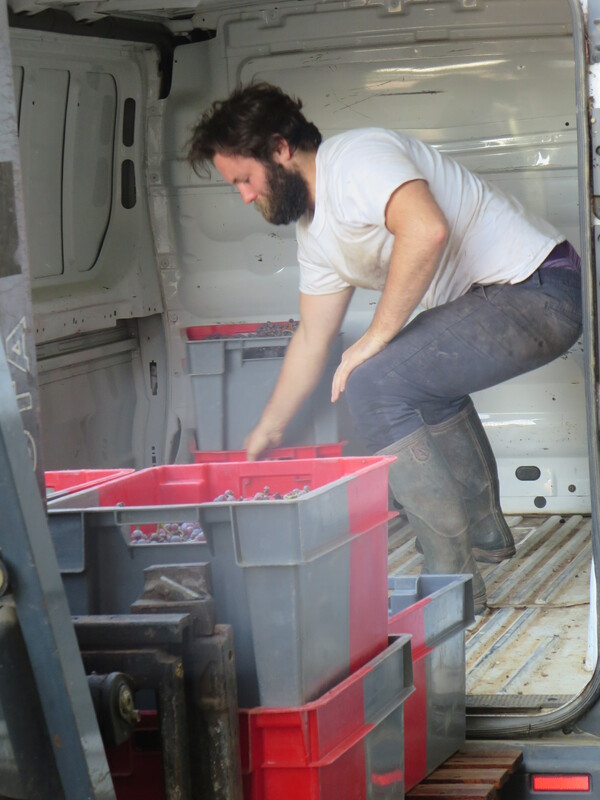 Karim is a fishmonger from Tours with an extensive knowledge of natural wines. He spent the week in Puimisson and brought a lovely surprise in the form of lobsters and scallops which made a wonderful dinner on Tuesday as Karim is also an excellent cook. 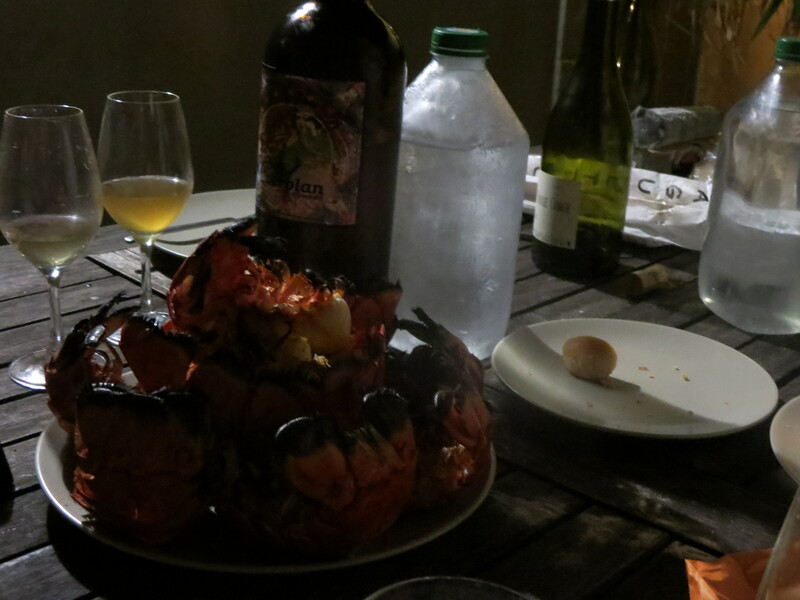 We shared a magnum of Casa Pardet Chardonnay to accompany the shellfish as well as two Carignan Blancs, one from Mas Coutelou and the other from Jeff’s friend Cyril Fahl of Domaine Rouge Gorge in Roussillon. It was a special and hugely enjoyable meal, thanks to Karim and Jeff for the food and wine. Categories: Vignerons, Vines, Wines | Tags: 7 Rue De La Pompe, Carignan Blanc, Classe, Flower Power, Grenache, La Garrigue, La Vigne Haute, Mas Coutelou, oxidation, Peilhan, pigeage, Segrairals, Syrah | Permalink. 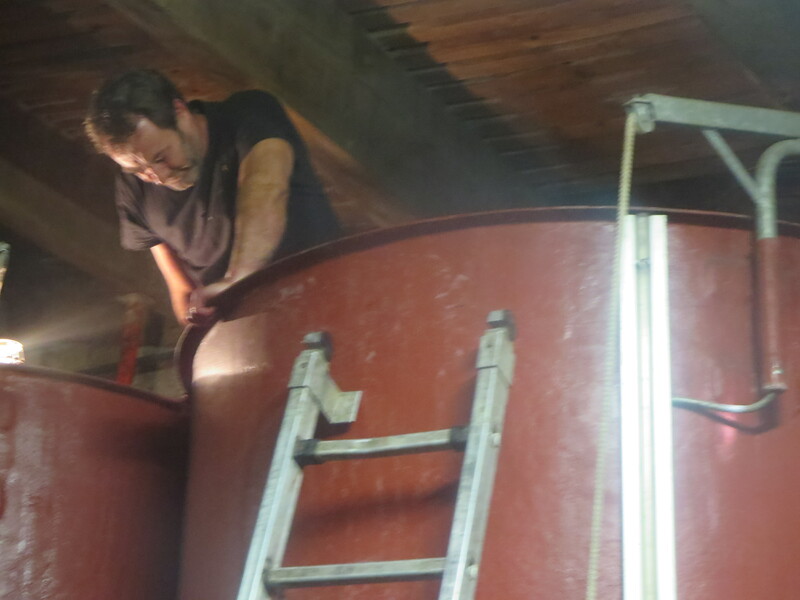 We went to Stephane Tissot’s yesterday and saw winemaking in full swing, including cleaning the amphorae, and we also talked to the Frederik Lornet team in the vines. Everyone super happy. Up in Pupillin a big party sounded as if it was coming from up at Philippe Bornard’s, maybe they’d just finished. Working hard at Hughes-Beguet cave too this pm. We are just outsiders observing. Next week we will be back in rainy England for our (sic) harvest, but you are #livingthedream🌈. Indeed I am David, though my dream somehow never included aches and pains and cuts and scratches 🙂 Or is that just age? We had big storms last weekend which are having a knock on effect but I am glad things are going well in the Jura and elsewhere. 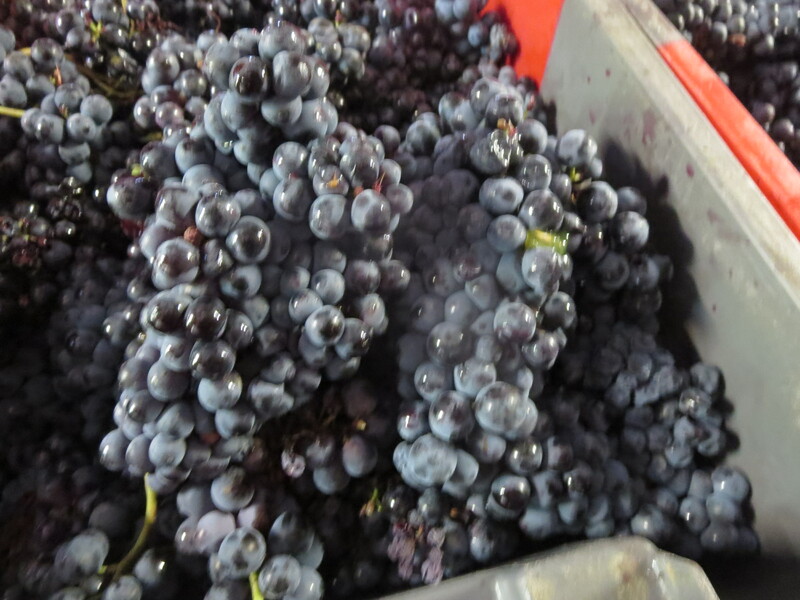 Happily the rain hasn’t ruined most of the grapes, lovely Carignan today for example. 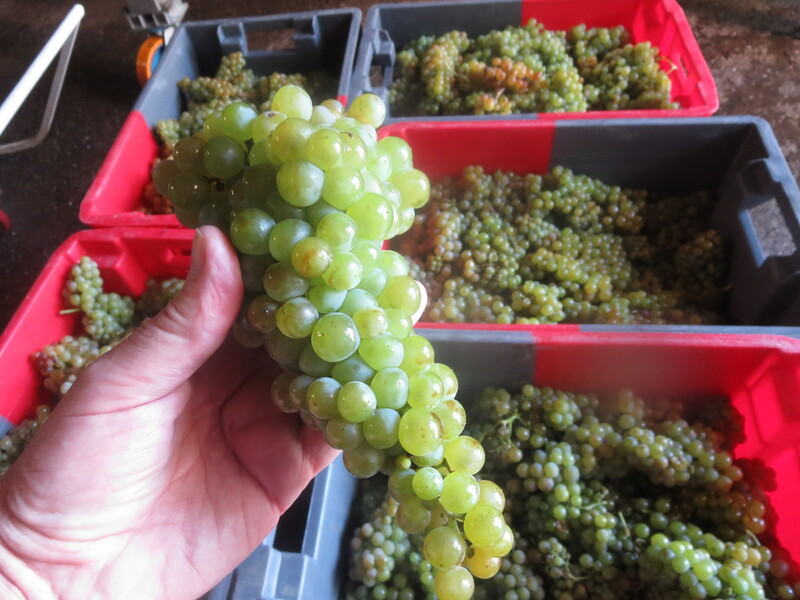 Fascinating to see the wines starting to take shape now, losing their puppy fat and turning into youthful adults. Enjoy the rest of your time, I can taste that Comté from here!